iRideSafe™ is a driver and passenger safety resource, created to educate the public about critical safety practices and everyday precautions that can dramatically improve your and your family's safety while riding in a motor vehicle. iRideSafe™ is a public service program of Montlick & Associates, developed as part of the Personal Injury Law Firm's ongoing commitment to safety education and injury prevention. "We see the devastation and heartache that families experience after a serious car crash, and we never want to see anyone get hurt," says David Montlick, Founder and CEO of Montlick & Associates. "That's why iRideSafe™ is so important to us." The iRideSafe™ mission is to help drivers differentiate between safe and "at-risk" driving behaviors, and to become more aware of basic motor vehicle laws. A library of easy-to-follow videos and downloadable guides are available at no charge and with no registration required. The website includes information on topics such as child passenger safety, teen and adult driver safety, and important product recalls and news. "Our hope is that families will make safe driving their mission too," says Jenny Harty, Montlick & Associates' iRideSafe™ Program Director. "Our goal is for everyone to arrive alive and unharmed every ride." 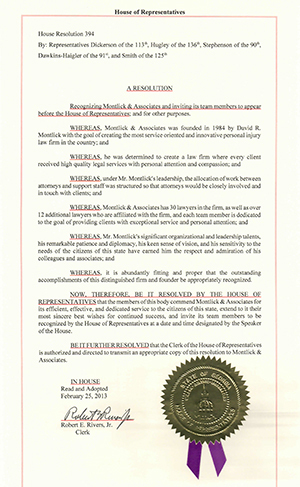 Since 1984, the experienced Attorneys at Montlick & Associates have successfully handled thousands of cases for injured people by getting them the compensation and benefits they deserve. Today, over 165 attorneys and staff members provide high quality legal services, with the personal attention they deserve, to individuals and families who have suffered serious injuries or death. For a free consultation with Montlick & Associates call them 24/7 at 1-800-LAW-NEED (1-800-529-6333) or use their email form or 24/7 Live Chat at Montlick.com. Montlick's Family Safety and Legal Tips program: Montlick segments air weekly on WSB-TV's "The Daily 2" to help raise awareness of important and often lesser-known safety risks and also educate the public on important state laws. Lifeprint Next Generation: The firm is the exclusive sponsor in GA for this child safety program that provides parents with vital tools needed to help protect and recover missing children. 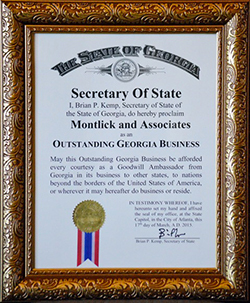 Commitment to Education Sponsor: Montlick & Associates has partnered with Channel 2 and The Atlanta Families' Awards for Excellence in Education for several years now to provide financial support and public recognition of the best teachers and administrators in Atlanta. SafeTeen Georgia Driving Academy Sponsor: The firm is a long-standing sponsor of the Safe America Foundation's Teen Driver event, designed to give young drivers hands-on experience in a safe learning environment. Montlick Military Tributes and Photo Contest: The firm has produced and televised dozens of messages, featuring Georgia military personnel and their families and thanking them for their service. These tributes air extensively around Memorial Day, July 4th, and Veteran's Day. Montlick's Most Deserving Military Family Contest: Since 2008, Montlick has partnered with WSB-TV to recognize deserving military families through a contest that awards an all-expense paid vacation to any destination in the continental U.S., with the winning family featured in WSB's prime time special "Salute 2 to America" on July 4th. Fallen Heroes of Georgia 5K Run: Montlick is a lead sponsor of the Fallen Heroes of Georgia race each year which honors Georgia's fallen soldiers.